CMC’s high-performance computing environment composed of large-scale computing systems and large-scale visualization systems is introduced. Large-scale computing systems and large-scale visualization systems are explained in terms of architectural overview, performance and software. Scientists and researchers can learn how to use our large-scale computing systems from the following pages. 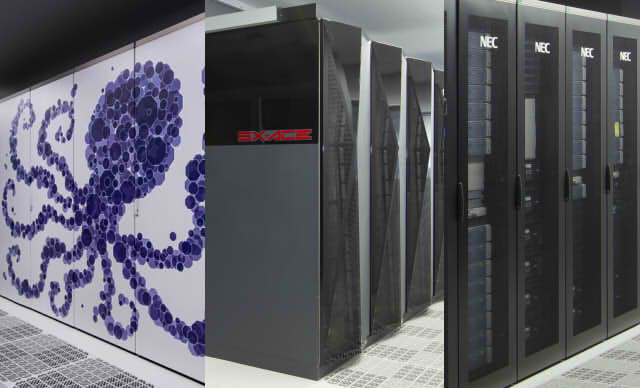 To use our high-performance computing environment, users first need to access our supercomputer network called CMC-Scinet. In the following pages, the basics for how to use the systems, including access, programming, and job submission, are explained. Our center has introduced "Batch processing" for program execution. Under batch processing, users are required to describe a "job class" in users' job request script when requesting specific computational resources. Job class information is available on the following page.